We have been playing with the boats and channel systems for two weeks. Today we packed up the chanels and filled the dry creek bed with water. 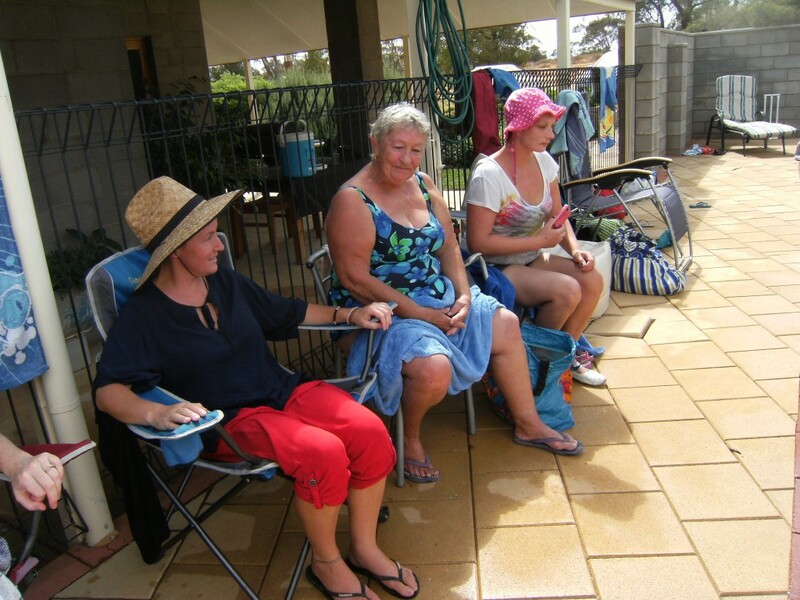 The girls were calling it ‘Rocky Rockville’ and they enjoyed sitting in the cool water. Anders said, “Lets move the rocks so the boat can come through.” They were trying to get the boat to move under the bridge and out the other side. 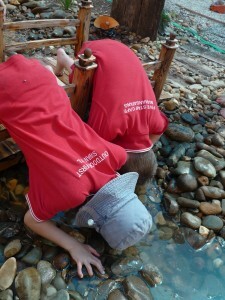 Together the children moved lots of rocks to make a channel. Some of the children worked on this for over 40 minutes. Lots of problem solving and collaboration happening here! 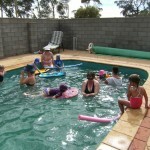 Today was not a Pre School Day, but Mrs Grant invited all the families to her house for a Pool Party. Now everyone knows where Mrs Grant lives. 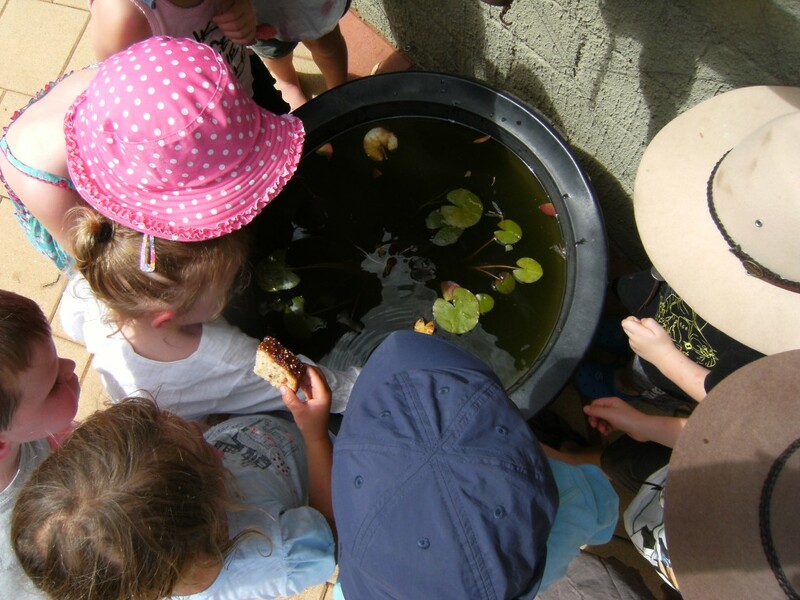 Her boys have a pet yabby in a pond. Mrs Grant’s cat, Smokey, went into hiding and we couldn’t find him. 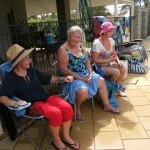 It was very hot and we enjoyed our swim and party food for lunch. 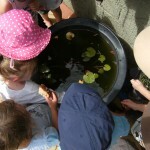 Days like this help the children to connect with their teacher in another setting. They are able to relate the stories I tell at morning meeting about my farm and family to what they have experienced today. Jayda has a new baby brother called Chayse. Chayse is two months old. 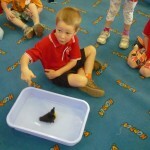 Jayda’s Mum brought him into Pre School this afternoon for a bath. Chayse liked his bath and he had a smile for us. We talked about the things that we can do and the things that Chayse can do. Chayse can drink milk and sleep. He kicked his legs and waved his arms around. Identity: We were all babies once and every birthday we grow a year older and we can do more things on our own. Some babies are boys and some are girls! 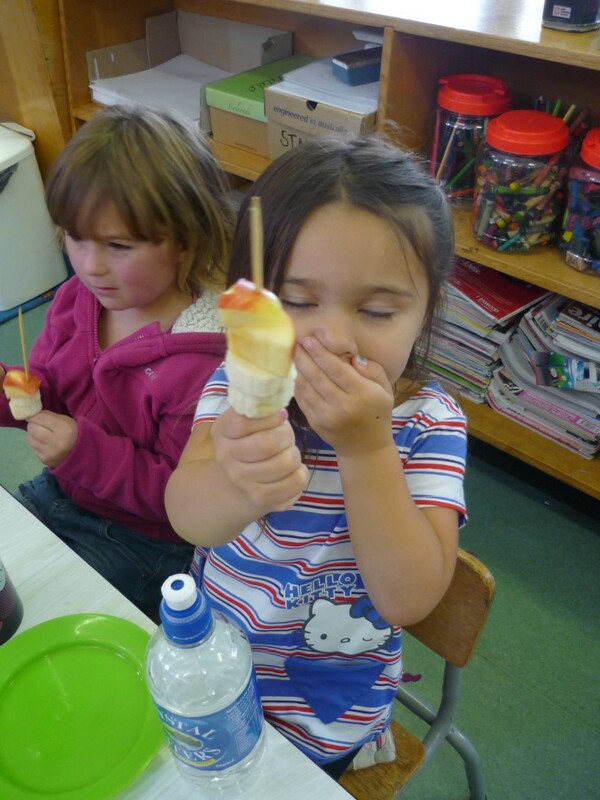 We are great fruit eaters at Pre School. 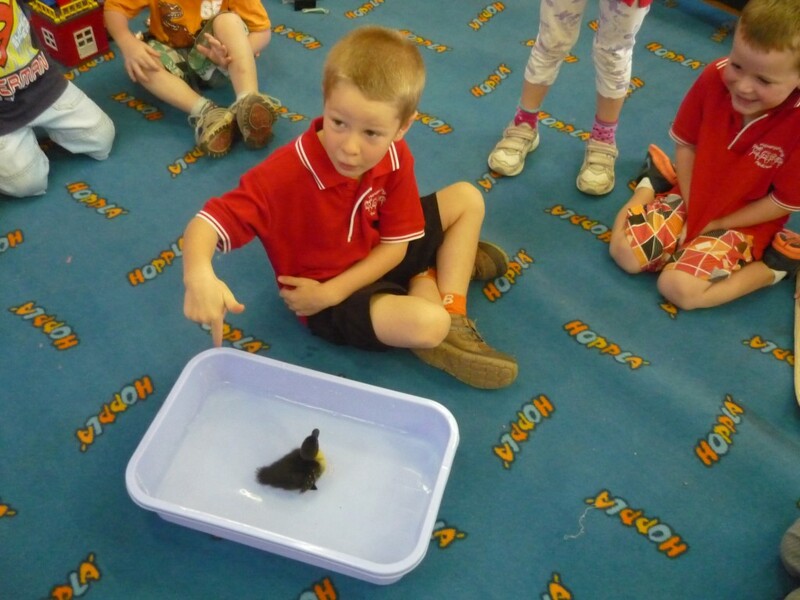 Lachlan’s Mum brought in their new pet to Pre School today. 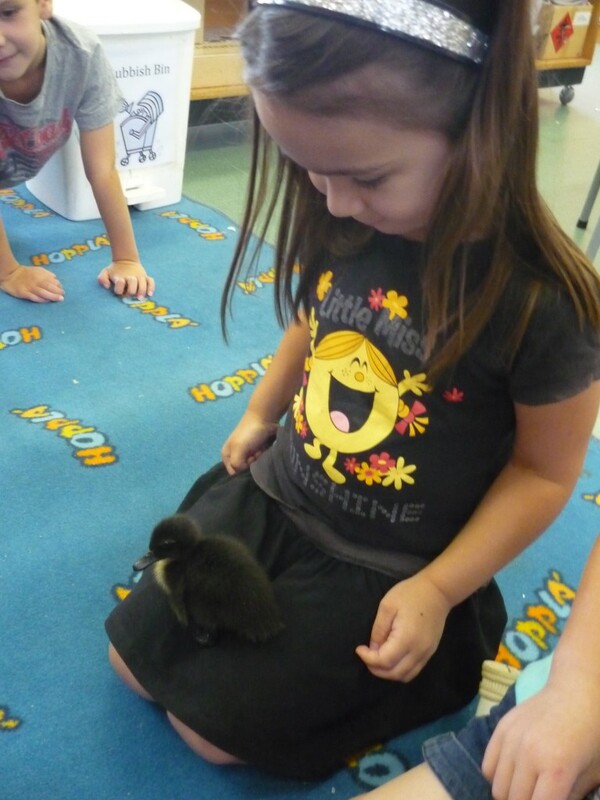 Daisy is a black and yellow duckling and is about a week old. We sat in a circle to watch her antics. Our rule was that Daisy was allowed to touch us, but so that she didn’t become stressed, we were not allowed to touch her. Daisy loved playing with Hailee. 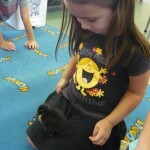 We think it was because Hailee’s clothes were black and yellow – like Daisy! Hailee said, “She thinks I am her sister!” We put Daisy in the water canel outside and and she had a lovely time paddling around. Daisy ate an ant from Cooper’s shorts. We watched Daisy having fun for a long, long time. She was so cute. We all laughed when she landed on her back and had trouble getting back onto her legs. 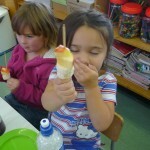 We learnt that Daisy must eat wet grain and grated carrot and that she might change colour as she grows up. Daisy likes to follow people. 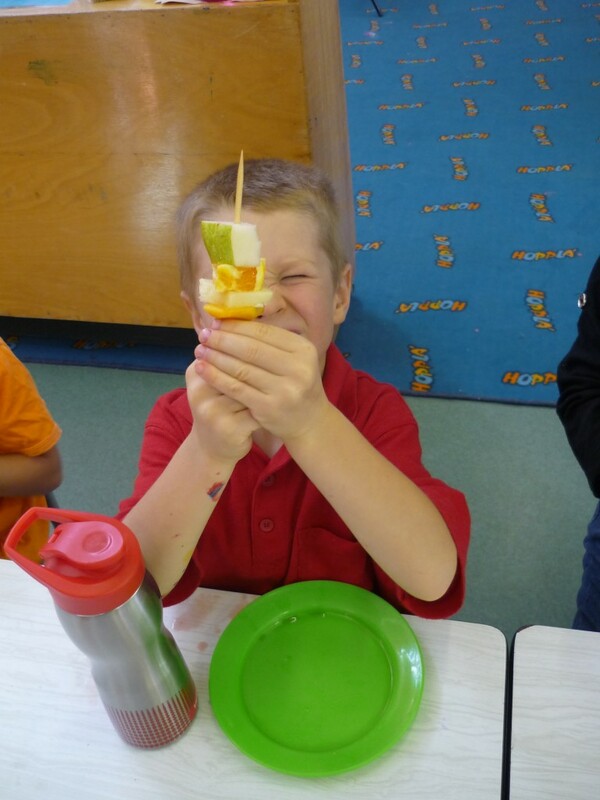 Thank you for sharing your pet with us today Lachlan. 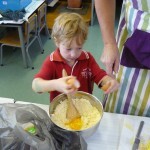 We all enjoyed celebrating Pancake Day at Pre School this week. We took it in turns to add the ingredients and mix the batter. We ate our pancakes with honey, jam and bananas. 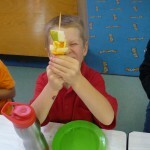 The children were in charge of spreading their own toppings. 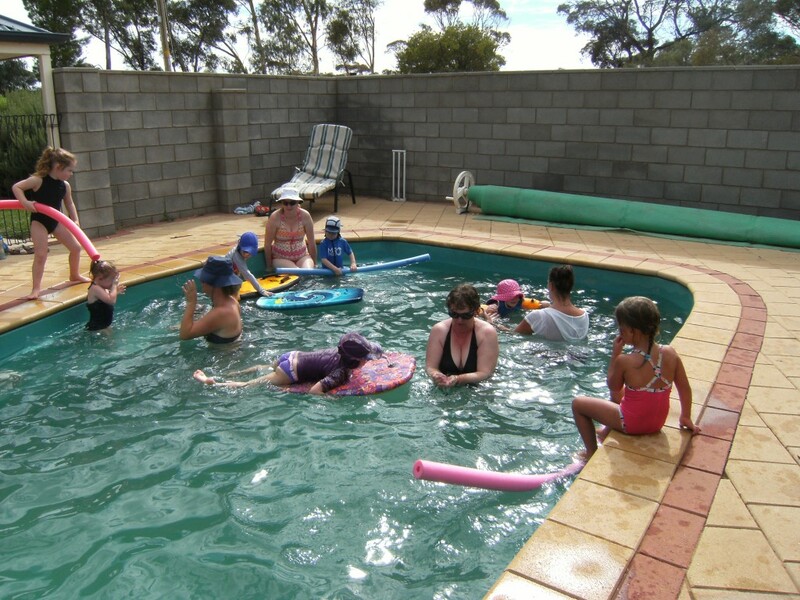 This was a challenge for some but everyone persisted. Well done. We will put plastic knives at the play dough table so that we can continue to practice cutting. This will help us further develop our Fine Motor Skills. We have a fire drill at the beginning of each term. 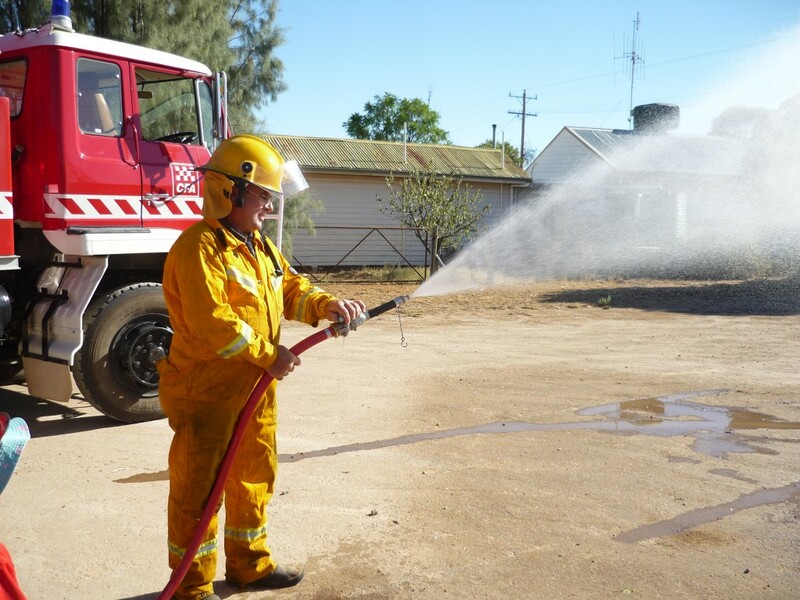 For our fire drill today we invited Mr John Hughes, Captain of the Manangatang Fire Brigade to bring the fire truck to Pre School. 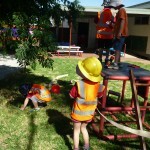 We had fun role playing Fire Scenario’s in the playground later and with our Fire DUPLO Set. Thank you Mr Hughes for an exciting morning. 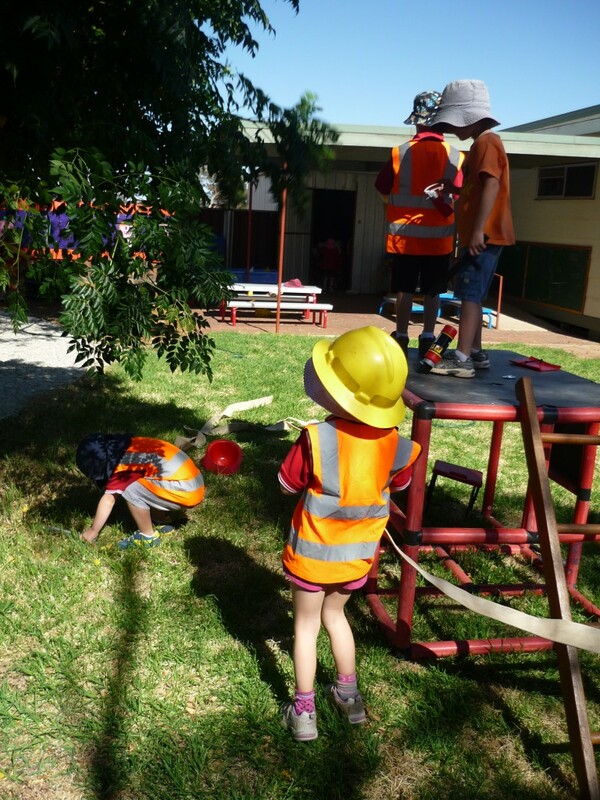 We learnt about fire safety and lots of new words, including names for tools. 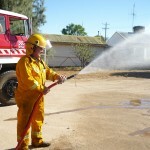 Being a fireman is a very important job in a community and some of us might become firemen when we grow up. “Quick. Wake the kids up!” said Cooper to his fellow firemen. 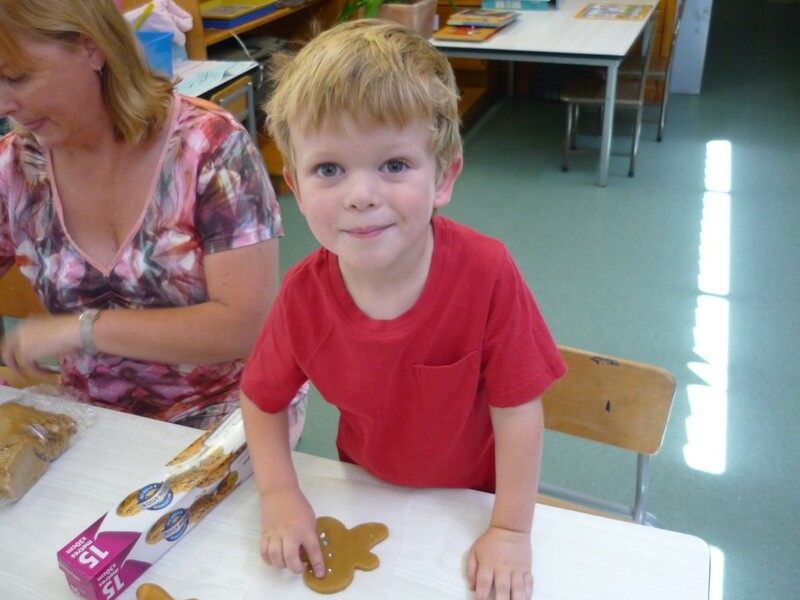 Today we enjoyed the story of the Gingerbread Man. 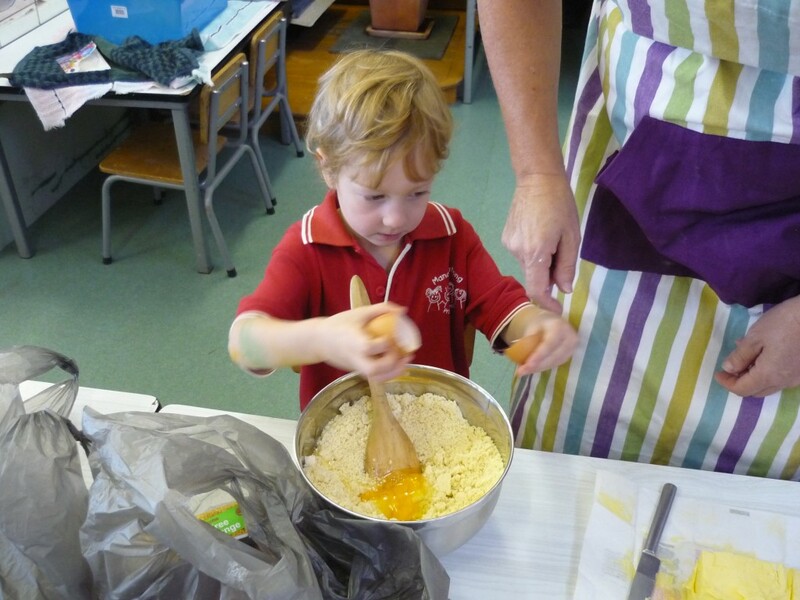 Some of the children had already heard the story and could tell us about the characters and quote “Run, Run …..” At the back of the story was a recipe. 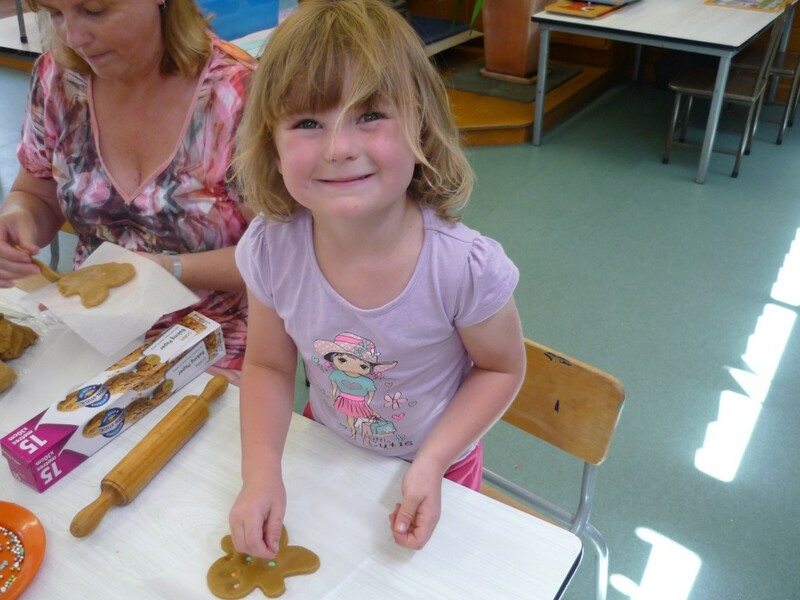 By directing the children to focus on the pictures accompanying the text, one of the children was able to tell me that it was a recipe for how to make Gingerbread Men. When we made the recipe we had so much dough left that we decided to make them again the next day. The children were much more efficient at rolling and extra creative with their decorating having had the experience the previous day. 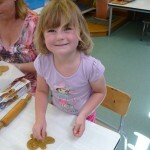 Our Gingerbread Men were YUM! 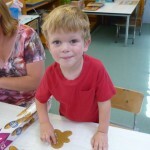 In outdoor play a few days later the children used the felt Gingerbread Teddy and took turns in playing the roles of the Gingerbread man and the Fox. This fits with Communication as we were retelling the story in our play.